“Over the past few weeks, transport fares had risen beyond the affordability of the commuting public,” she said. 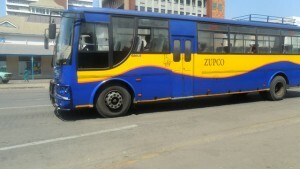 Minister Mutsvangwa said the move was part of Government’s long term plan to modernise the entire mass public transport system. “The modernisation of the mass public transport system will ensure low-cost, efficient and professional service to the commuting public as well as reduce the country’s fuel costs and decongest the Central Business Districts as buses carry more people compared to smaller forms of transportation. “Government is working on further plans to modernise our whole national transport system at rates affordable to the ordinary persons,” she said. “There are sufficient buses to ensure that the public can travel to work and to schools on Monday,” he said. Minister Mutsvangwa also revealed that the fuel supply was normalising with the commodity now available at most service stations after distribution was affected by last week’s riots. “With regards to the fuel issue, Government would like to inform the public that the situation is slowly normalising,” she said. “Government has put in place a facility that will ensure that adequate fuel is available to the motoring public. “We are pleased to note that the security situation has normalised and all peace loving Zimbabweans are freely conducting their day-to-day activities without hindrance. Too little too late – the horse has already bolted from the stable.